For all their destructive power, most volcanic eruptions are local events. Lava flows tend to reach only a few miles at most, while airborne ash and soot travel a little farther. But occasionally, larger eruptions can launch particles into the stratosphere, more than 6 miles above Earth's surface. 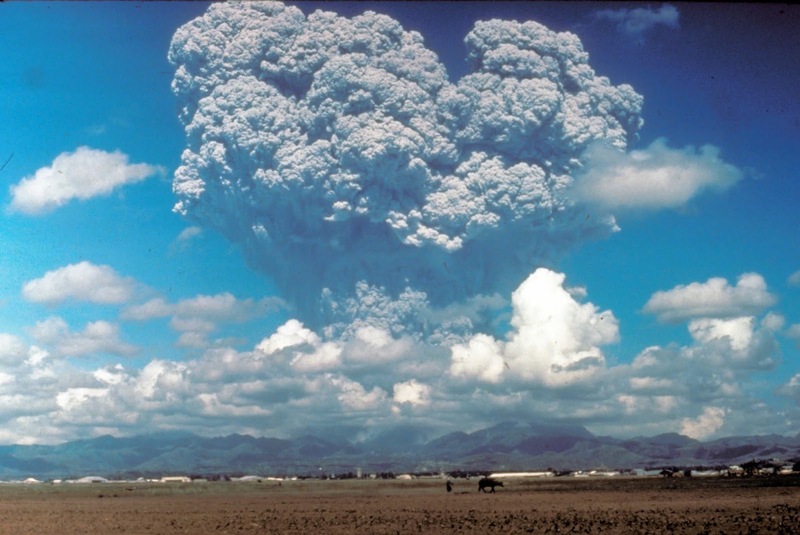 The 1991 eruption of Mount Pinatubo in the Philippines--the world's largest eruption in the past 100 years--is a prime example of a stratospheric eruption. This photo, taken on June 12, 1991, shows the eruption column of Mount Pinatubo on Luzon Island in the Philippines. Using their method, the researchers made some important revisions to the known history of big eruptions--correcting the record on several misidentified events while discovering a few as yet unknown stratospheric eruptions. The researchers described their approach, which identifies airborne volcanic particles with a specific chemical signature, in a paper published in the journal Nature Communications. "I find it very exciting that we are able to use chemical signals to build a highly accurate record of large, climate-relevant stratospheric eruptions," said James Farquhar, a professor of geology at UMD and a co-author of the research paper. "This historical record will be highly useful for climate scientists seeking to understand the role of large eruptions in climate oscillations. But there is also the basic marvel of reading a chemical fingerprint that is left behind in ice." Eventually, volcanic particles fall from the stratosphere, settling on the ground below. When they land on snow, the particles get covered up by more snow that gets compacted into ice. This preserves a record of the eruption that survives until the ice melts. Researchers can drill and retrieve ice cores in places like Antarctica and Greenland, revealing eruption records that stretch back several thousand years. 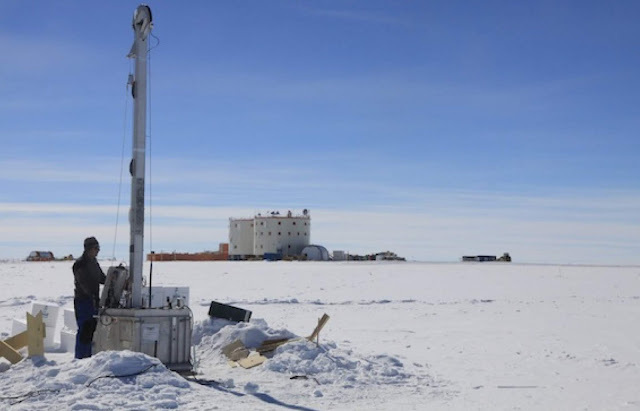 Because particles from large stratospheric eruptions can spread across the globe before falling to the ground, previous methods identified stratospheric eruptions by looking for sulfate particle layers in ice from both hemispheres--usually from Antarctica and Greenland. If the same layers of sulfate showed up in both cores, deposited at the same time in Earth's history, researchers would conclude that the particles came from the same large, stratospheric eruption. "For eruptions that are intense enough to inject material into the stratosphere, there is a telltale signature in the sulfur isotope ratios of sulfate preserved in ancient ice layers," explained Farquhar, who also has an appointment in UMD's Earth System Science Interdisciplinary Center. "By instead focusing on this distinct sulfur isotope signature, our new method yielded some surprising and useful results. We found that prior reconstructions missed some stratospheric events and falsely identified others." The study's lead author, Elsa Gautier from the Université Grenoble Alpes, did a significant portion of the analyses at UMD while on a Fulbright scholarship to work with Farquhar in 2013. Following Gautier's lead, the researchers developed their method using ice cores collected at a remote site in Antarctica called Dome C. One of the highest points on the Antarctic ice sheet, Dome C is home to ice layers that stretch back nearly 50,000 years. Gautier and her colleague Joel Savarino, also at the Université Grenoble Alpes, collected ice cores at Dome C that contain records stretching back roughly 2,600 years, covering a large portion of recorded human history. The researchers also found some big stratospheric events that contain the isotope signature, but were somehow constrained to the Southern Hemisphere. "This is a strength of our approach, because these events would have a climate impact but are missed by other methods," Farquhar said. "We have made a significant improvement to the reconstruction of large stratospheric eruptions that occurred over the past 2,600 years. This is critically important for understanding the role of volcanic eruptions on climate and possibly for understanding certain events in human history, such as widespread famines. It can also help to inform future climate models that will take large volcanic events into account."